Retirement planning is an important area of an individual’s and a family’s life. Proper planning will allow for a better life and one that is usually more enjoyable. For most folks in the United States, retirement planning includes saving as much money as they can in their 401(k) and maximizing their monthly social security payment. Unfortunately, when a family is faced with the challenge of planning for the lifetime support needs of a child with special needs, as well as their own retirement, bolstering their 401(k) and maximizing their monthly social security payment may be the two most detrimental decisions to make. 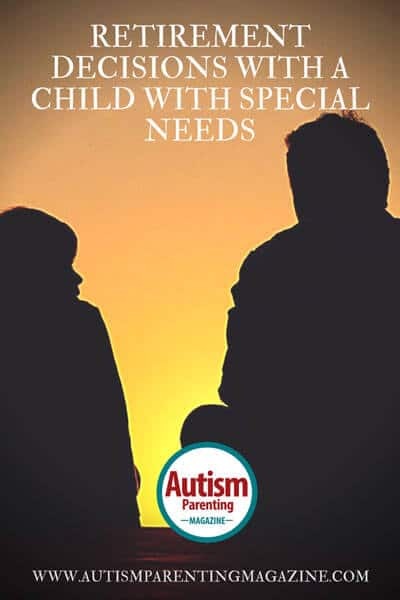 Special Needs Trusts and government benefits are usually two critical elements in planning for a child with special needs. The government benefits provide a monthly income for the individual, and for some families, an income for a parent or caregiver who stays home with their loved one as their primary caregiver. Benefits can also provide therapies, life-skill services, transportation, medical care, housing supports, and more. However, for as much as these government benefits provide, they rarely cover all of an individual’s life sustaining needs, which is why most parents and families intend to provide additional funds [at their death] to ensure their loved one has the proper quality of life. In order to continue to qualify for government benefits, an individual with a disability is only allowed to have a maximum of $2,000 in their name, which introduces quite a conundrum for parents and families. This is where a unique legal tool, called a Special Needs Trust, comes in to play. As long as any funds the family leaves for its loved one is left to a properly-drafted Special Needs Trust, its government benefits will not be negatively affected. So, why is a 401(k) and maximizing my monthly income from Social Security a potential problem? TAXES – A Special Needs Trust has compressed tax brackets, which means that income generated from within a Special Needs Trust can very quickly find the highest tax bracket (39.6% federal in 2016, plus your state tax rate) – which, depending on the state you live in, can quickly reach nearly 50%. If a family plans to fund their Special Needs Trust with the remaining value of a parent’s 401(k) account, this money has never been taxed and therefore will be taxed inside the Special Needs Trust at most likely higher tax rates than the parents have ever paid. A parent does not want to find out that upon his/her passing, 45-50% of the money intended to support the child is now on its way to the United States government in the form of taxes. Government benefit programs that are used to support an individual with a disability not only have an asset limit, but also have a monthly income maximum in order to continue to qualify. If an individual with a disability was diagnosed before the age of 22, then the monthly income calculation will be adjusted based upon the social security retirement income decision of his/her parent. In 2016, the child’s income will be adjusted to receive 50% of their parent’s Social Security retirement income. For instance, if Dad retires and begins his social security at 66, and his benefit will be $2,300, then his son with special needs is eligible to receive $1,150 per month. Depending on this son’s situation, this amount of income could cause his son to lose some or all of his benefits, or he might be forced to pay a high deductible (which could be as much as $900) each month in order to keep his benefits. It is very common to be on the path that leads to the results explained above, due to the fact most advice does not consider multi-generational planning and most advisors do not understand the system your family must plan within. However, there are ways to adjust so as to avoid those costly errors. It is important to understand and coordinate your family plan, your child’s plan, the tax code, and the government benefit system so as to make the best decision possible in order to provide for your lifetime and the lifetime of your child. For more information on how to prepare for the future, be sure to contact a financial advisor who specializes in serving families with special needs. A Special Needs Plan is driven by what they call Unleash L.I.F.E.™- L.I.F.E. meaning Lasting Independence For Everyone™. This is accomplished with education, action, and support in the creation, implementation, and continued monitoring of a specifically-designed lifelong and integrated plan for your family: parents, caregivers, your loved one with special needs, and their siblings.